Just plant your Oya in the garden and fill it with water every few days. The porous clay takes care of the rest. 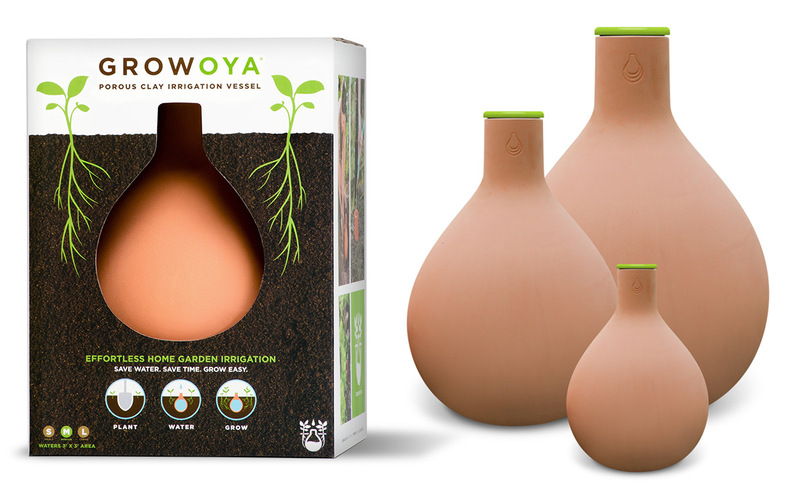 Maybe you say this sounds to good to be true so we want to share exactly how Growoyas work! An ancient form of localized plant irrigation, ollas (we call them Oyas like they’re pronounced) are terracotta pots that you plant in your garden to save water, save time and make your growing easier. Terracotta is a porous material–and even more so when fired at a low temperature–allowing the water inside to seep out slowly through the walls to water your plants at the roots. Bury your Oyas in the ground and refill with water every 5-10 days. Once established, the roots of your plants will instinctively grow towards the water source (you’ll need to surface water also for the first couple weeks). Over time the roots attach themselves to the outside of the Oya and draw water out as they need it. They take just what they need, not more, not less. This makes Oyas a low tech, high efficiency, self watering system. Save a whole bunch of water (up to 70% water savings from surface watering), save your valuable time (water only once a week!) and grow easy (less weeds, less guesswork, better plants). It’s truly that simple. #GrowEasy. Stop by Standley Feed & Seed to get your Growoya today! Find out what size Growoya you need for your garden here. Read more at www.growoya.com. This entry was posted on Friday, October 7th, 2016 at 6:09 pm	and is filed under News & Updates. You can follow any responses to this entry through the RSS 2.0 feed. Both comments and pings are currently closed. Sign up for our free monthly newsletter. Stay informed on new products and store specials.